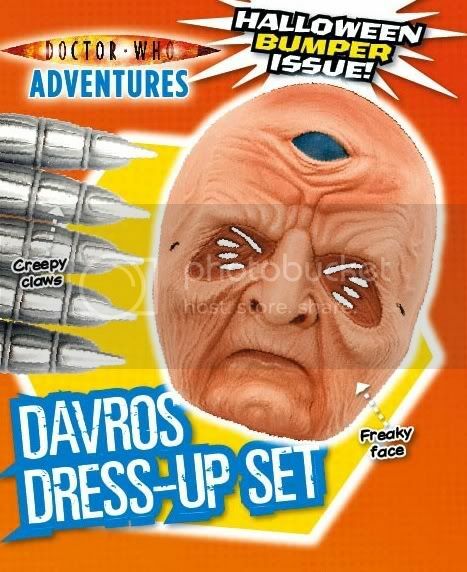 Dress up as Davros for Halloween! With Halloween just round the corner, you’ll find the perfect dress-up set in this week’s bumper Doctor Who Adventures! The magazine comes with a fantastic Davros mask and set of creepy claws so you can pretend to be the creator of the Daleks! Inside the mag, we show you how to make a Davros control panel. And you can also find out how to enter a competition to win a life-size Dalek Sec! This issue is essential for all Dalek fans! o Three posters! We’ve got posters of Carrionites, Children of Time and The Sarah Jane Adventures! o Fear file: The top ten Halloween horrors. o News: Results of the DWA readers’ favourite 2008 episode. o Blast from the Past: The Fourth Doctor regenerates in Logopolis. o Who knows? : Your questions answered! o Sarah Jane Adventures: Facts about Luke Smith and next-episode preview. o Draw: We’ve got a mean Sontaran for you to colour in. o Ultimate Tenth Doctor: Part 3 of our mini mag about the Tenth Doctor. o Comic strip: The concluding part of Titanoleum Tourists. o Bloodtide and Doomfinger’s woven word search: Find the missing word for a chance to win a cool prize. o Time Teasers: Great puzzles to complete. o Win: Loads of goodies! o Subscription offer: Subscribe and you’ll get FREE Doctor Who Dalek and Cybermen figures. 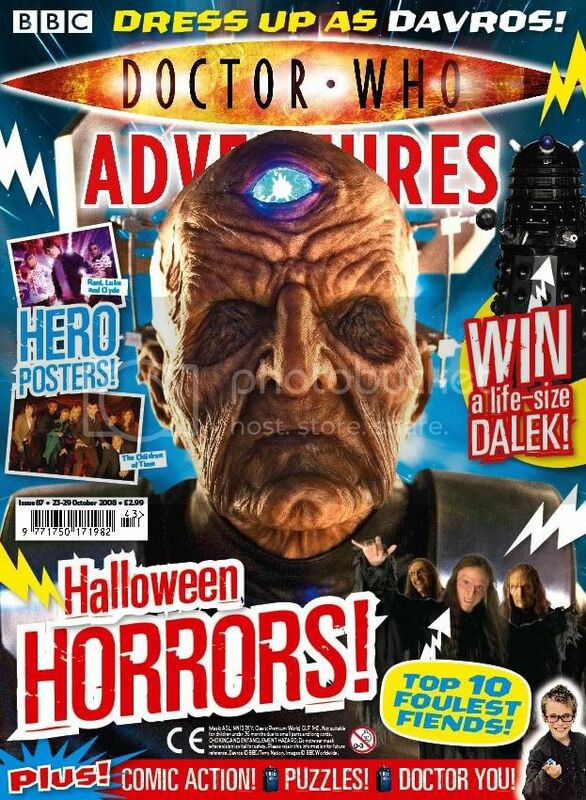 This bumper Halloween edition of Doctor Who Adventures, priced £2.99, is in shops now! Capture Davros before he escapes! This entry was posted on October 24, 2008 at 3:13 pm and is filed under Doctor Who Adventures. You can follow any responses to this entry through the RSS 2.0 feed. You can leave a response, or trackback from your own site.